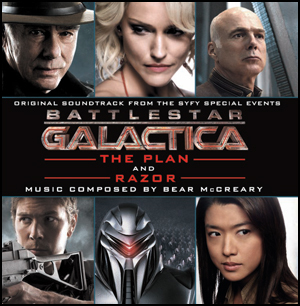 Next month, La La Land Records will release the final* official Battlestar Galactica soundtrack album: Battlestar Galactica: The Plan / Razor. This CD includes cues from the two straight-to-DVD films that flanked either side of Season 4. 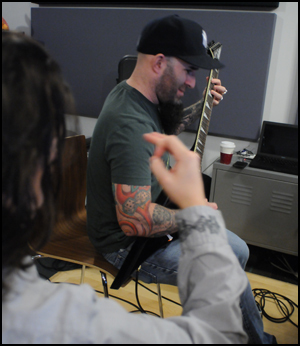 The first track features a very special musical guest: Scott Ian of Anthrax! The first thing you’ll probably notice is that cues from both films are mixed up together. I apologize in advance to soundtrack album purists, but I wanted to create a seamless listening experience. The events of both films basically take place at the same time chronologically anyway, so it made sense to combine the tracks. Despite my initial reservations that somehow this album wouldn’t be as diverse as my full-season soundtracks, there are some really wonderful pieces on here. You guys have waited patiently for years for “Attack on the Scorpion Shipyards” and “Husker in Combat” from Razor, and they will all be worth the wait. However, the standout tracks for me are the variations of “Apocalypse” from The Plan. In the film, these pieces bring a brutal, heavy metal sound to the BSG instrumentation. For the album release, I wanted to get it even heavier, and was fortunate enough to collaborate with Anthrax guitarist Scott Ian. Scott and I met a while ago, and had been looking for a good project to work on together. This soundtrack provided the perfect opportunity. He brought his gear into our studio and laid down some brutal riffs on “Apocalypse (Theme from ‘The Plan’),” the end credits piece. His guitar sound is massive, and takes the track to a whole new level, without changing the spirit of the music at all. You guys will love it. Thanks to Scott for bringing the little video recorder so we could do this. I’m actually considering doing more video blogs similar to this in the future. Would this kind of behind-the-scenes footage of recording sessions be something you guys would be interested in seeing more of? Obviously, we could get better quality audio and video in the future, but the general idea would be the same. I don’t know, it could be boring or cool. What do you guys think? I am happily surprised by how great this album turned out. 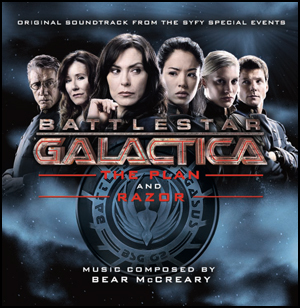 It may yet become an essential album in the BSG soundtrack collection. I hope you guys will check it out. What I like about this is that you can turn the book around in the jewel case if you want, so you can pick which movie is on the cover of your album. Cool, right?